33rd District Update: Week Four- Legislative Action Before "Crossover"
Home > News > 33rd District Update: Week Four- Legislative Action Before "Crossover"
Wow. What a week last week was in the General Assembly. The 2019 session is now at our halfway mark, known as crossover! The House has completed action on its own legislation (except the budget) and we are making progress on several key issues as we begin considering legislation passed by the Senate. 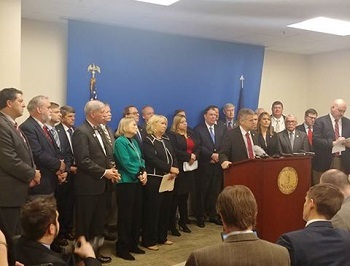 Virginia Democrats have revealed just how extreme their abortion policies are, and made abundantly clear what would become the law of the Commonwealth if they ever won a majority in the General Assembly. Twenty-one House Democrats have co-sponsored, and undoubtedly many more support, this bill to lift important restrictions on late-term abortions. This is a stunning and open acknowledgment that the policies being proposed by Democrats would allow abortion for any reason, at any time during a pregnancy. The Governor also made extremely disturbing comments which appear to extend such decisions even beyond birth when he said, [after the birth], “a discussion would ensue between the physicians & mother.” These comments, and these policies, are reprehensible and outside of the mainstream, even among pro-choice voters. Unfortunately, they appear to represent the honest position of Democrats in Virginia. Supporters of this legislation are claiming that these comments are taken out of context, but these are their own words in raw, unedited form. You can watch the video of Delegate Tran by clicking here. The governor’s comments were aired in-full, live on the radio, you can watch those here. Last week I presented a budget amendment to block the use of our tax dollars from being used to fund disability-selection abortions through Medicaid. As you might guess, the Democrats opposed the effort and the exchange got a little tense. When the Democrat insisted on talking about fetuses, I requested he use English, and call babies, babies. Thank you for joining me in prayer and standing up for life. The House of Delegates is advancing a series of bills to stop Governor Ralph Northam’s hidden tax increase and ensure that all individual tax revenue from the Tax Cuts and Jobs Act is used to provide tax relief to middle class families. On Monday, the House Finance Committee passed a package of legislation to guarantee $950 million in middle-class tax relief. This includes tax relief legislation introduced by Delegate Tim Hugo and tax conformity legislation introduced by Chairman Chris Jones. House Bill 2355 (Jones) will conform Virginia’s tax code to the federal tax code. This legislation will set aside all increased revenue from the Tax Cuts and Jobs Act into a special “Taxpayer Relief Fund” to ensure that this money is used to provide tax relief. House Bill 2529 (Hugo) will stop Governor Ralph Northam’s hidden tax increase and provide tax relief to hardworking Virginians. The legislation will allow taxpayers to itemize their state taxes regardless of how they file their federal return, increase the state standard deduction across the board, and maintain the important state and local tax (SALT) deduction as it exists today. Conforming Virginia’s tax code will allow taxpayers to begin filing their taxes immediately without any delays or confusion. Governor Northam proposed using the new revenue to finance approximately $2.2 billion in new spending. Our plan, on the other hand, will provide $575 million in tax relief immediately and set aside all other revenue collected from individuals, approximately $400 million, to be refunded to taxpayers. Our plan protects a middle class family that itemizes from what could be roughly a $805 tax increase, or providing an additional $115 in tax relief to a family that chooses the standard deduction. The House budget that was released on Sunday will not spend one dime of the increased revenues from the Tax Cuts and Jobs Act. Our plan will set aside all new revenue in the “Taxpayer Relief Fund” or into our state savings accounts. It’s time to have the conversation: Give it back or spend it? For House Republicans, the answer is clear, you deserve more money back in your pocket. Last week was a very busy one for my legislation. Early Monday morning, I presented HB 2567, which would protect the free exercise of religion on college campuses. We also had meetings with various education organizations from back home, including the Loudoun Education Association, the Frederick County Education Association, and a group of Clarke County teachers. In the afternoon, I presented two more education-oriented bills: HB 2570, which encourages parental involvement in their children’s education by requiring their permission for their children to take family life education classes in school, and HB 2574, to allow implementation of performance-based assessments in School Divisions of Innovation, which Loudoun County is trying to implement. Both of these bills passed the House later in the week. I also had a hearing on HJ 683, my Constitutional Amendment to protect transportation funds from diversion to other uses. On Tuesday morning, I presented HB 2805, which will fix a loophole hindering parking access for persons with disabilities, a need brought to me by a constituent; this bill is now on its way to the Senate. I also was able to speak on HB 2569, my bill to streamline approval of small in-home child-care services, which also made it through the full House. 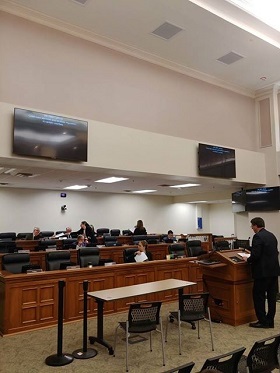 After session, I presented HJ 684, to establish a formal code of ethics among K-12 educators to prevent political indoctrination in our public schools, and HJ 694, to study the current discrepancies in air ambulance services in different areas of the Commonwealth. Finally, I presented a bill to require greater accountability and transparency when state agencies contract out projects. 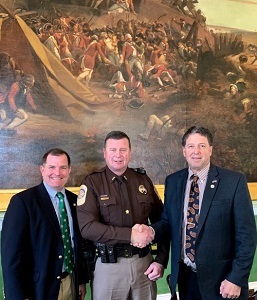 Wednesday morning, presented HB 2806, to protect citizens from being penalized for violation of local ordinances when the ordinances are not readily available to the public. 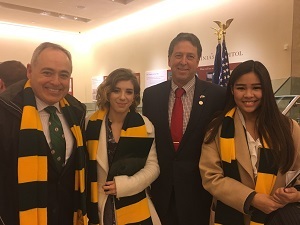 After an Education Committee meeting, I met with students from George Mason University to discuss broadband, education, and other issues that our Virginia students currently face. These meetings produced fruitful discussions and I look forward to working with the students of the Commonwealth going forward. After session, I presented budget amendments to fund improved replacement of the state-owned agricultural education facility destroyed by fire at Clermont farm in Berryville, as well as operation funding for the new Loudoun State Park. 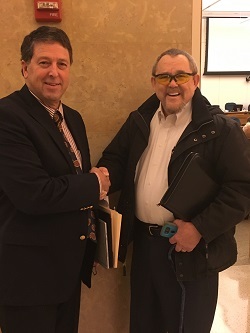 On Thursday, January 31, I was able to meet with Speaker Cox before heading to my committee hearings for the day. In addition, I attended a press conference regarding Del. Tran and Gov. Northam’s legislation and statements regarding abortion. Later on, I presented HB 2799, to restore full authority to the State Corporation Commission to regulate tolls along the Dulles Greenway. To end the week, Friday morning saw my proposed constitutional Amendment, HJ 683, go down on a close vote in the Privileges and Elections committee. My local ordinances bill also was defeated in the Counties, Cities, and Towns Committee, when members made a motion to send it to the Committee for Courts of Justice. It's always great to see visitors from the district. Please stop by our office if you're in the Richmond area in the next five weeks! John McCann came to Richmond to testify on the parking access for people with disabilities bill he suggested to me. Lieutenant Warren Gosnell of the Frederick County Sheriffs Office. Warren received the Governor's Transportation Safety Award for Law Enforcement last year. He also saved three lives by administering Narcan to individuals overdosing on opioids in our area and saved a fourth life by performing CPR to an unresponsive driver who suffered a heart attack behind the wheel. Warren is a dedicated officer to our community and we honored him on the House floor.